When there's no time to sketch. In David's book, he includes a few more reasons but I think the above are the ones I relate to the most. I would add, "when you want to see more than your eye or your binoculars can reveal". To my naked eye, and even through my binoculars, this beautiful female Polar Bear appeared to be simply walking, wandering through the tundra vegetation sniffing. To my surprise, when I viewed an image taken with my 400 mm lens and zoomed in to take an even closer look, she was actually pulling and chewing grass. This has become one of my favorite memories for its serenity in contrast to her primary lifestyle of hunting seals on sea ice. Polar Bears live in a harsh environment. Females fast during the summer and fall months while they are denning and nursing their cubs. They live on the layer of blubber that they have stored beneath their dark skin. The blubber both insulates them from the cold and provides nutrition during months when there is no sea ice. It also provides the fat-rich milk that nourishes their cubs. 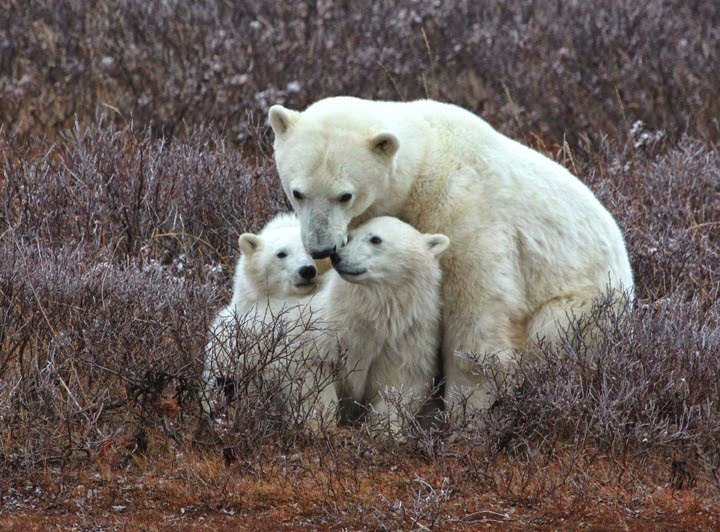 Polar Bears are marine mammals and carnivores, at home in the water as much as on land. They rely heavily on the sea ice ecosystem that nourishes ringed seals which, in turn, provide the nutrition and blubber that Polar Bears require to survive. Sea ice is vital to bear hunting, resting, warmth and breeding. 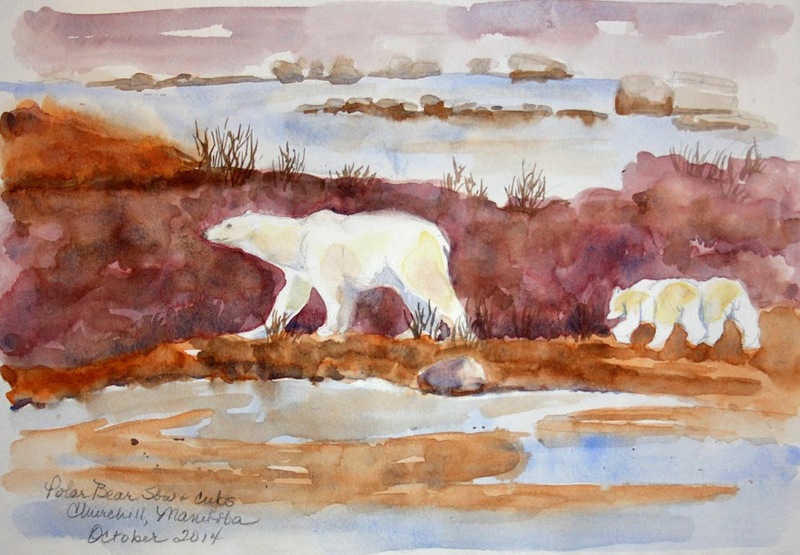 For more sketches and information visit Polar Bears on the Hudson Bay at Vickie's Sketchbook. 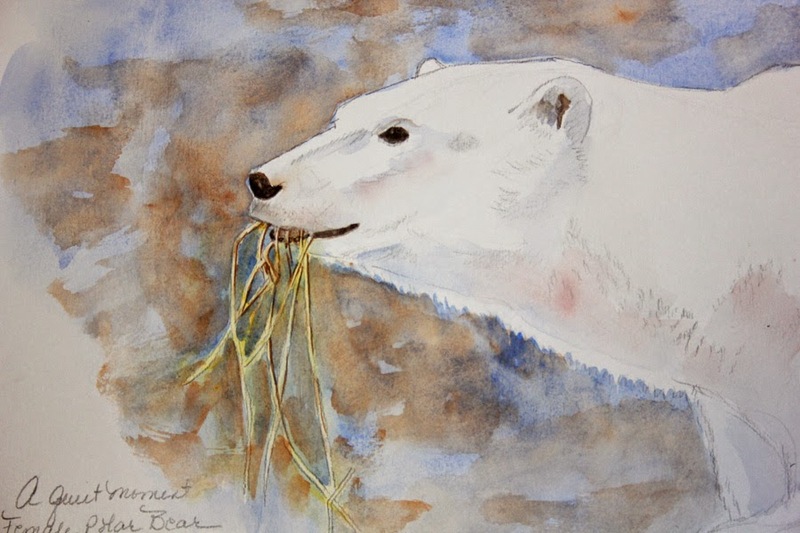 To learn about my journey to Churchill, visit Journey to Churchill at Vickie Henderson Art. Such lovely paintings, Vickie. Thank you for posting the link. I enjoyed reading the polar bear series. Thank you, Susan. I'm glad you enjoyed visiting the series. I feel privileged to have experienced these bears which makes me happy to share it!